This was the second occasion that we were invited by HP to build a registration site for a European incentive. This was for a total of 300 incentive winners to attend with their partners. This microsite needed to reflect the importance of the event and to create excitement and anticipation amongst the attendees. Fully styled site – It was a requirement to remain with the corporate branding guidelines for HP, but we were given sufficient flexibility to create a unique site that would be sufficiently inspirational in look and style to reflect the importance of the incentive trip. Partner attendees – The site managed 300 main incentive winners together with partners who were registered at the same time. A variety of reports were needed to reflect their varying requirements for accommodation and activities. Particular site features – There were a significant number of options that participants could select, both for themselves and for their partners who could select different options . With capacity management, we also needed to make sure that it was not possible to sign up for more than one activity at the same time. 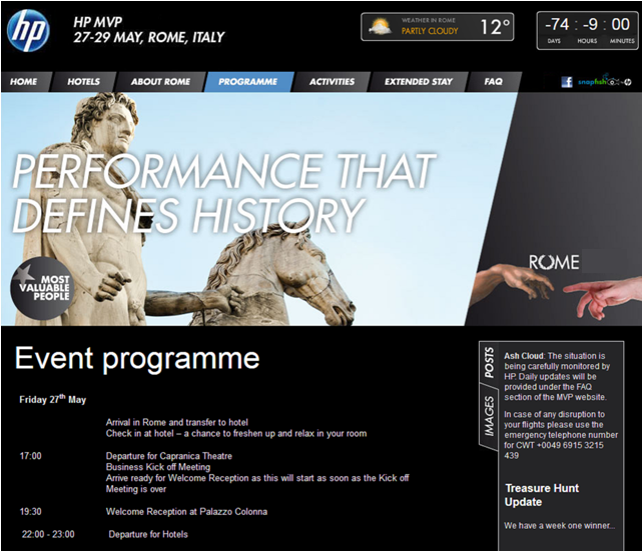 The site included an interactive map showing where in Rome the various attractions, events and hotels were located. We also had an event countdown clock on the home page.